A Year of FHE: FREE PRINTABLE // How Is a New LDS Latter-day Prophet & Church President Called? 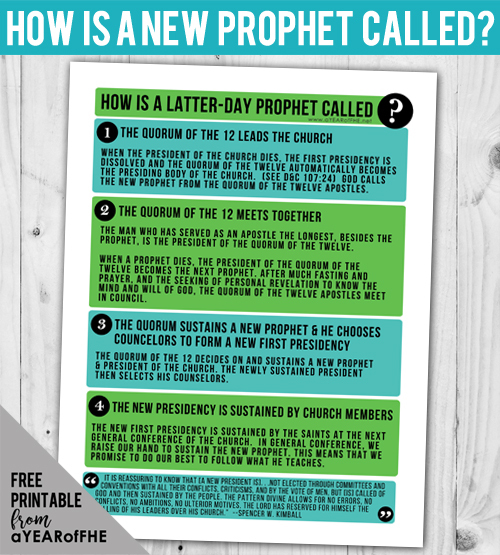 FREE PRINTABLE // How Is a New LDS Latter-day Prophet & Church President Called? With the recent passing of President Thomas S. Monson I know many families will want an easy way to explain to their kids and teens how a new Prophet and President of the church is chosen. I made this printable chart to show the process and included a great quote from Spencer W. Kimball about the succession of the church Presidency. I will post a brand new Family Home Evening lesson this Sunday all about the new Prophet, his life, and his teachings! This was such a fantastic teaching tool! Thank you!